Repair tools are things that you should have inside your homes. They could help maintain your house making it more functional and comfortable to live in. You could use these tools in home repairs such as squeaky and sticky doors, loose hinges on cabinet doors, smelly dishwasher, loose showerhead, replace burned out bulbs, weather stripping, clogged drains, and loose cabinet knob, among others. What are these tools? Here are the following tools that we think you must have to fix these simple home repairs. A tape measure is very useful in many ways. It could be used for measuring space so that you will know if your furniture and appliances fit into your door or in one area of your house. Also, it could help in estimating the number of materials you need for small home projects. And if you want to measure any things inside your house, a tape measure is the one accurate thing to use. One of the most used tools in the house is the screwdriver. It is advisable that you must have a set of it that includes the X-shape screwdriver, the Phillips, and flathead screwdriver with various blade tips and sizes. This type of tool is often used for fixing loose cabinet and door knobs and hinges, assembling furniture, removing light switch covers, and other home repairs. Yes, homeowners need a hammer to pound and pull nails. Also, it could be used to tap things into place. A hammer has this one side, which is flat and used for pounding, Meanwhile, the other side has a V-shaped notch that is used for pulling nails from wood or concrete. There are different types of the hammer and you could choose the one that suits your needs and durable too. If you need to straighten up or balance something, a level is a perfect thing to use. This tool could be used in hanging mirrors, artworks, and pictures on the wall. Pliers help in holding and fastening objects, pinching, pulling, and bending material. Among the common types of pliers are the tongue-and-groove pliers that chiefly used for crimping and fastening. The other type is the needle-nose pliers that could aid in gripping, bending, and cutting wires. Probably, you want to adjust your steel headboard, you may be needing a spanner. This tool is often used to turn objects such as nuts and bolts. It also keeps these objects from turning. Among the types of the wrench are combination spanner, open-end spanner, box-end spanner, flare-nut spanner, and adjustable spanner. Definitely, you will need a drill to bore holes for the screw and nails for mounting a flat-screen TV or other tasks. It is actually used for drilling. It may be cordless or without a cord. The cordless is usually battery-operated and you could reach high places to bore. If you are going to change fixtures in high area or paint, you need a ladder or step tool. Also, this tool could be used for reaching the bulb and stringing lights. In addition, you will need a ladder tool if you are going to clean your ceiling or walls. The flashlight is often used in repairing fixtures placed in dark areas. You could also see small components needed to repair when you use a flashlight. Staple guns could be used for fastening object quickly. These include securing or fastening a carpet or a sheet of insulation or fabric. They are easy to use too. You will never know how these tools are important unless you use them. And in time, you will certainly need and use them. Be sure that you have them inside your toolbox. 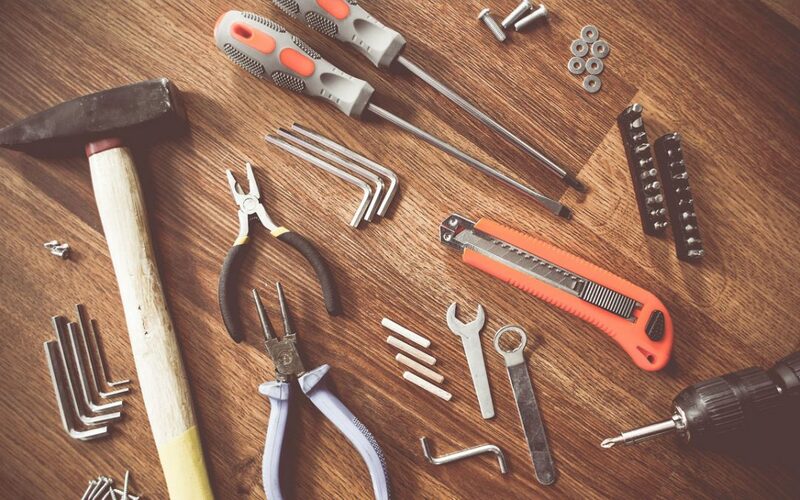 Home repairs will definitely be easy to fix with the help of these tools.